Image Size: 20"w x 16"h.
Great artists are master storytellers, telling their tales one stroke at a time. Just as an author chooses his words designed to have the greatest impact on his readers, Weistling applies another visual word or sentence every time his brush touches the canvas. In a work of extraordinary warmth and beauty, "First Blossoms," is not only a story of the annual awakening of Spring, but of the splendor of the world in the eyes of a child. She, like the season, embraces the world with the light and promise of not only the present but of things to come. 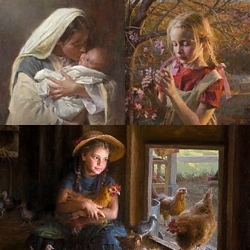 "First Blossoms" is a work of art that grabs your attention from across the room and demonstrates why Morgan Weistling is regarded as one of the most important contemporary impressionists painting today.